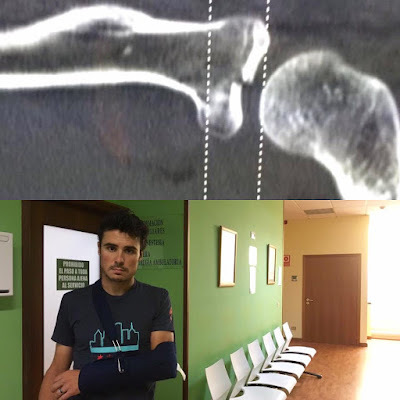 According to BBC, Javier Gomez Noya has pulled out of his Olympic campaign due a bike crash and a broken ellbow. Gomez was one of the podium candidates and suffered already in build-up for Beijing 2008 a hipp injury and missed a medal. He got the silver medal in London 2012. Javier Gomez Noya is a DNS at Rio Olympics 2016. Photos: Javier Gomez Noya on Facebook. "I'm really sorry to let you all know that yesterday, when I was just about to finish my bike training, I had one of those silly crashes, no faster than 15km/h. Immediately I felt pain in my elbow so we went to the hospital. Scans have confirmed a displaced fracture in the radial head of my left arm. Going into surgery today to fix it. Unfortunately this has forced me to pull out of competing in Rio. I need to be realistic, there is no time to prepare and to be fit on the start line of the games. The most sensible thing is to open my spot and allow someone else the chance to race. As you can imagine, this is a really tough time, it's a goal I have been working for over many years. I will keep fighting, I still have many goals in this sport, I'm not done yet. I feel sad and disappointed to give you this news, thanks for the ongoing support."